Adirondack Camping Village is a family-friendly campground and RV park located in the serene mountains near Lake George. As the upcoming season grew near, Sean Lambert (Owner) knew that his website could do a better job of attracting more travelers and appealing to campers’ vacation planning behaviors. 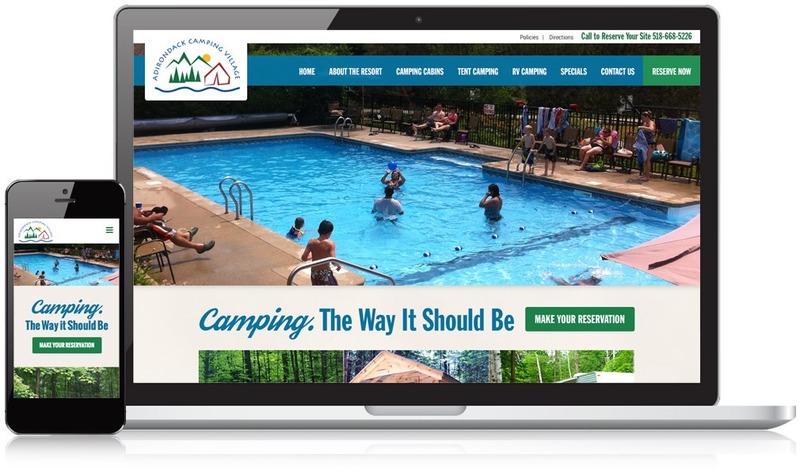 Sean needed a professional, modern website for helping potential guests discover his Lake George campground online, creating a user-friendly experience for travelers who were browsing the website on their mobile devices, and conveying all the reasons that campers enjoy staying at Adirondack Camping Village! 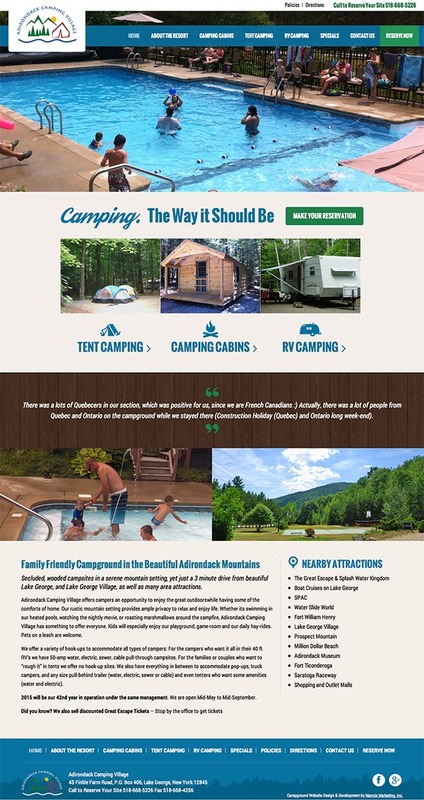 From the home page, the new website visually and verbally introduces potential guests to the campgrounds while conveying what makes Adirondack Campground Village one of the favorite campgrounds in Lake George, NY. Because Adirondack Camping Village caters to campers who are searching for tent, cabin, and RV camping, we created custom graphics on the home page to illustrate the campgrounds’ 3 options. This simplifies the process of helping campers find the right option for their needs and guides them to a landing page where they’ll find details about the amenities and seasonal rates. Nearby attractions are featured directly on the home page to give potential guests an idea of how close the park is located to the various beaches, amusement parks, and landmarks around the Lake George region. Of course, images of the amenities and campsites help illustrate the campgrounds’ secluded location for travelers who are seeking a more peaceful getaway. Likewise, the Amenities page gives Adirondack Camping Village an opportunity to show the ample supply of fun activities and things-to-do on-site for campers who simply prefer to kick-back and relax at the campgrounds during their stay. With more travelers using mobile devices to browse the web and visit websites for campgrounds near Lake George, it was essential that Adirondack Camping Village’s new website be optimized for smartphone and tablet devices. By creating a mobile-optimized responsive website design, potential guests can quickly and easily learn about the campsites and amenities, contact the property for reservations, and much more from their mobile devices. Built with SEO in mind, the new website was developed to help Adirondack Camping Village get found in the search engines when travelers searched for keyword phrases related to campgrounds and RV parks in Lake George, NY. In the few short months after the new website went live online, it had already attracted 50% more visits from people who were using their mobile devices. Further, the website brought in over 30% more traffic from people who found Adirondack Camping Village in the organic search results.